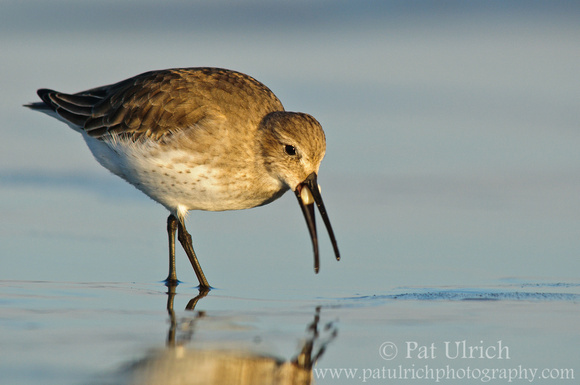 A dunlin in winter plumage pulls a clam from the sand at low tide and swallows it whole. This image is from a nice trip I took to the Parker River National Wildlife Refuge on Plum Island last month. I was there for the sunset, and watched a good-sized flock of sanderlings, dunlin, and plovers feeding during the very low tide. For my shots that evening, I picked a spot in the sand near where the flock was feeding, and in front of the general direction they were headed. I put the sun to my back, placed my tripod flat on the ground, made myself look as small as possible, and started to wait. Soon enough the entire flock had circled around me, and I was able to watch them feed up close. A few dunlin eventually came so close that I couldn't even keep focus on them (and my lens has an 8.5' MFD!). I always enjoy these intimate encounters with shorebirds, and it makes the drive home with wet clothes all the more worth it. View more of my photos of dunlin. This post submitted to World Bird Wednesday -- follow the link to check out this weeks posts! What a happy drive home that must have been after getting these spectacular shots! Love the light! Gorgeous image, Pat! 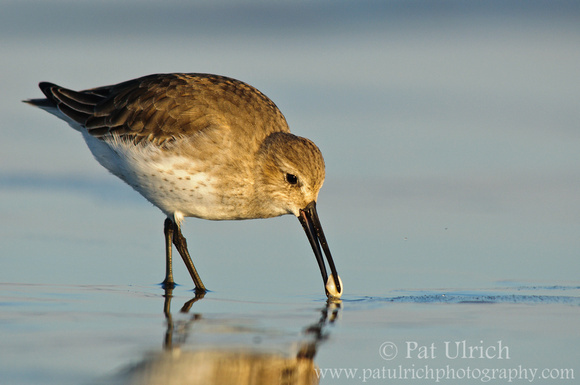 Beautiful photos of the Dunlin. I find the most shorebirds will come quite close if you act similar to what you described. It's well worth the sand and water to get such great photos. Worth being wet and sandy for . Great shots indeed and I liked your sneaky way of doing it too. Great captures!! Boom & Gary of the Vermilon River, Canada. Brilliant photos Pat. I love it when the birds come close of their own accord. Beautiful subject and very nice foreground/background Pat. Perfection! Lovely lighting and detail. What a glorious experience that must have been. The clarity of your photographs never ceases to amaze me Pat. Thanks for the link, I spent a wonderful hour delving into those flight shots. What a mindblowing collection. Much appreciated! Hi there - another great picture - although I have to say the Dunlin looks like it’s about to choke! You did a fantastic job with these. Definitely worth getting a little wet and sandy! WOW Pat!! These are brilliant! !